Hooray! 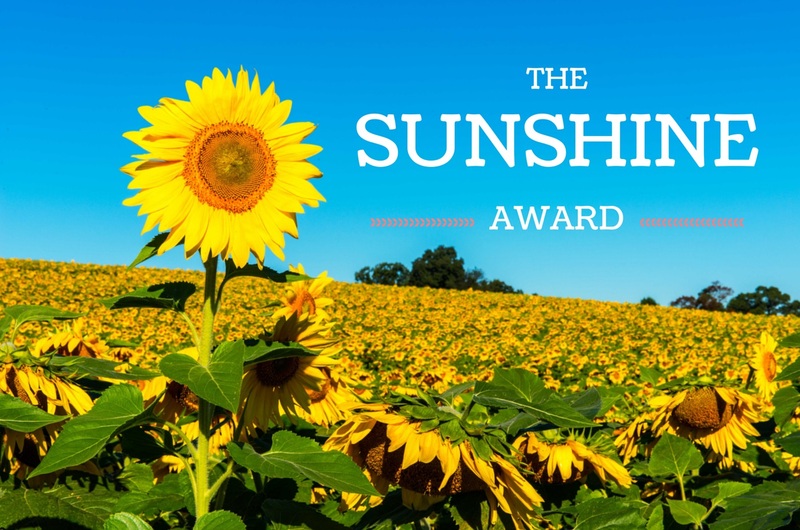 You have been Nominated for the Sunshine Award! Now, back to the Sunshine Award. There are some rules or guidelines that need to be followed in order to accept it. I can’t spell to save my life!!! 1. Do you clean everyday or is it more like, “Oh crap, we have people coming over!” and it’s a race to the finish line? I clean everyday. I feel too chaotic and nervous if my house is not clean. I think it’s much easier to clean as you go. 2. Bra or no bra, that is the question? 3. What is the craziest thing you’ve ever done and are willing to admit to the blogging world? I love to play pranks on my co-workers, we all get each other pretty good. One day I cut out a bunch of funny pictures and taped them over peoples drivers license pictures while they were working…it was rather amusing when they went to use their ids. 4. What is one thing you do or say that you probably shouldn’t? I’m a perfectionist at everything I do to my own detriment. My wonderful hubby always tells me, “You don’t have to be perfect all the time”. I’m working on it. 5. You go to a restaurant, what drink do you order? Water, Soda, coffee, alcohol? 6. You are in Walmart and see a mom in PJ pants with a baby only in a diaper…what do you do? 7. When you looked at yourself in the mirror today, what was the first thing you thought? I have got to get one of the girls at work to do something with my hair! All my life I drank ice tea. Then I ventured into hot tea. After my second lil boy I live for coffee! 9. What is your favorite thing to blog about? How to change your life with positive thinking. That life is filled with joy and possibilities and all you have to do is embrace it! Everyone deserves to hold their head high with confidence and feel their cheeks ache from with happiness…it’s within all of us we just have to discover it. 10. What’s in your purse/bag right now? My purse doubles as a diaper bag so I usually don’t carry anything more than a wallet, keys, and phone. It’s funny how your diaper bag changes from baby 1 to baby 2. Now I just throw a diaper, some cars, goldfish, and water in my bag and go. 11. Most embarrassing thing you have ever had happen that you are willing to share! My intense fear of bees and wasps has lead me to sporadic bouts of running and high pitched squeals (squeals like a puppy). I’ve even started telling people that I’m allergic because my phobia is so ridiculous and unfounded…I’ve never even been stung. I think that’s half the problem. I’m convinced that when I do get stung, when that fateful day occurs, I will go into anaphylactic shock and have to be airlifted to the closest hospital (an ambulance wouldn’t be fast enough, I don’t know why) where they would have to resuscitate me after I had gone toward the light. Yeah…that’s pretty irrational and embarrassing! If there was a movie you could live in (or would want to be your life) what would it be? What song or band do you listen to right now to get you excited for the day? What age do you feel like you are in your heart? What is the funniest thing you have heard a child say? What is the silliest thing you have ever done? Please reply below after you have completed your Sunshine Award. It will be fun to learn more about each other and see how everyone answers these questions!